Selected sections from Chapter 5 of Cathy Pearl’s new book Designing Voice User Interfaces: Principles of Conversational Experiences. 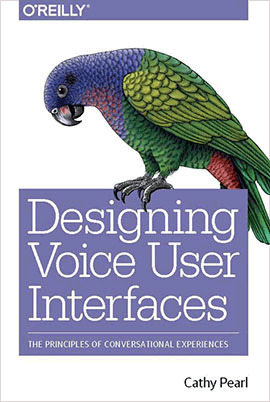 2017 O’Reilly Media, Inc.
[This] Chapter [covers advanced] voice user interface (VUI) design [topics]. Here, we take a look at what will make [your VUIs] engaging, easy to use, and successful. Siri and the Amazon Echo are both examples of popular VUIs. The Echo has recently received a lot of praise about its interface. Given that the two systems can do many similar things, why is the Echo often a better user experience? One reason is that the Echo was designed with voice in mind from the beginning—that’s its sole purpose. Siri, by comparison, is just one more way to interact with your iPhone. Much of what has been discussed so far relates to the speech recognition piece of VUIs, and not the natural-language understanding (NLU) part. Speech recognition refers to the words that the recognition engine returns; NLU is how you interpret those responses. Today, with the improvements in speech recognition accuracy, the challenges of designing a good VUI lie more in the NLU—the way the input is handled—than in the technology itself. Let’s begin by looking at the various ways a VUI can respond to input. Even when we talk to other humans, we often need to ask follow-up questions to ensure that we understand what the other person meant. … VUIs will of course encounter the same situations. This leads us to the next area of complexity: disambiguation. VUIs will of course encounter the same situations. People do not always give enough information to complete the task. As demonstrated in the preceding example of a customer simply ordering a “large,” people do not always give enough information to complete the task. 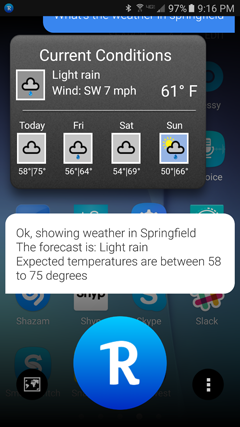 Take the example of asking for the weather in Springfield. In the United States, there are 34 towns and cities named Springfield. If I am in the United States and I say, “What’s the weather in Springfield?” the system should ask me which state. When thinking about this example, I decided to try a few different virtual assistants and see how they handled it. I was rather surprised to discover that none of them disambiguated. All seven that I tried just chose the city for me, without any follow-up! (All of them did correctly recognize “What’s the weather in Springfield?” because I could see the result displayed on the screen.) I’m in California, but the cities that the virtual assistants selected ranged dramatically, as Table 5-1 clearly shows. One, in fact, never told me the state, but simply said, “Springfield,” so I still have no idea which one it chose (Figure 5-1). Figure 5-1—I’m not even sure which Springfield Robin chose. What’s the weather in Springfield? In Springfield, Illinois, it’s currently 75 degrees. Hi there, I’m Pat, your tech support assistant. How can I help you today? I need help with the Internet. Internet. Sure, I can help with that. Let me get some more information from you first. I can help you set up your WiFi, find information online, or fix your Internet connection. Which one do you need help with? When the user gives too much information…, the ideal technique is to disambiguate. Take the first symptom recognized (fever). Reject the entire response because “fever and a cough” is not one of the available symptoms. I have a fever and a cough. Which one of those would you say is bothering you the most right now? OK, let’s start with the cough. I can also help with the fever symptom later. If the user said up front they had a fever, don’t ask about it later when asking questions about their cough. The system will lose credibility. Creators of VUI systems often think that if they just put all the instructions up front, people will say the right thing. You might be tempted to change the initial prompt to “Please tell me your main symptom, but only one.” This is not advisable. First, it makes the dialog less natural. Second, a lot of users will ignore it anyway. You still need to build in a way to respond. Doing user testing—with real users out in the world—will also help you to craft prompts to elicit the best responses. Which one would you like, a map or the phone number? OK, I’ll give you a map first and then the phone number. 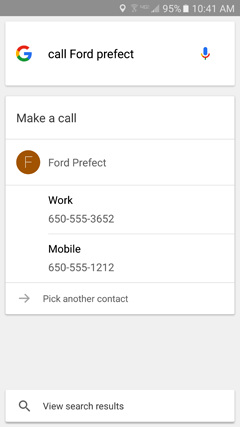 If I say nothing, Google adds additional help by saying, “To keep going, just say which phone number you want to use. For instance, you can say ‘the first one.’” It’s multimodal, of course: I can also tap the one I want (Figure 5-2). Being able to use my voice is important here because I might be driving or otherwise need hands-free interaction. Figure 5-2—Google disambiguating: which number do you want to call? This is a common workflow. Api’s Assistant uses a similar method, as depicted in Figure 5-3. I have noticed improvements to these systems over time. In the past, when I asked to text a contact, for example, Google asked if I wanted to text the home or mobile number. 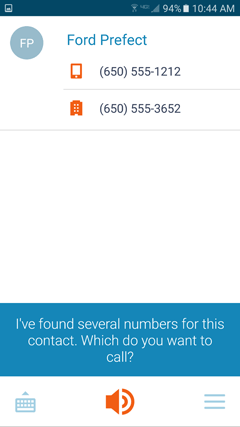 Recently, it defaults to the mobile number, which makes sense given that it’s impossible to text someone’s home phone. This illustrates the importance of looking out for negative responses, such as not, no, and neither. 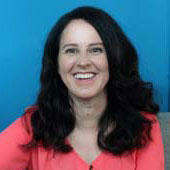 Imagine how the dialog would sound if upon asking, “How are you feeling today?” the user says “Not very good,” and your VUI—matching on the word good—responds with a cheery “Great to hear!” Your user will probably think your VUI is either sarcastic or stupid, neither of which makes a great impression. Handling these takes more work, but the cost of ignoring them can be high. 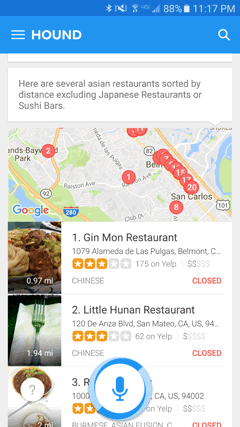 Hound has a good example of handling this well: when I say, “Show me nearby Asian restaurants except for Japanese,” it manages to do just that (Figure 5-5). As your VUI becomes more complex, your strategies for handling speech input must become smarter. The previous examples generally have one intent, or action, that the user wants to take. In the disambiguation example, when the user said, “Internet,” the system asked a clarifying question to determine what the user needed help with in terms of their Internet connection. Add an event to my calendar. Delete my meeting from my calendar. Building these types of models—and more complex ones—is beyond the scope of this book. There are third-party tools that you can use to create these more complex models. These tools provide sample sets of examples that allow you to build up a more complex set of ways in which users can interact with your VUI. Some examples of tools include Api.ai—now owned by Google; Nuance Mix, Wit.ai—Facebook; Houndify, Microsoft LUIS, and Amazon Echo. Dialog management is how the system manages what has already occurred in the conversation and what needs to happen next. To make your VUI as flexible as possible, a concept called dialog management will become important. Dialog management is how the system manages what has already occurred in the conversation and what needs to happen next. This is important because users want to provide information in different ways; someone will give all the information up front, and some will provide it piece by piece. To handle this, the app needs to know what bits of information are needed—these bits are sometimes referred to as slots—and in what order to ask for them. Hi there, welcome to Pearl’s Pizza, home of the famous gingerbread pizza crust. What kind of pizza can I get you? Um, I’d like a large pepperoni, please. That’s one large pepperoni. Great. What’s the delivery address? And finally, what’s your zip code? Uhh…yeah, I wanna order some pizzas. Great, that’s what I’m here for. How many would you like? OK, let’s start with the small. What ingredients would you like on that one? Olives, mushrooms, and sun-dried tomatoes. Olives, mushrooms, sun-dried tomatoes. Sounds delicious. Now, what about the large; what ingredients would you like on that one? 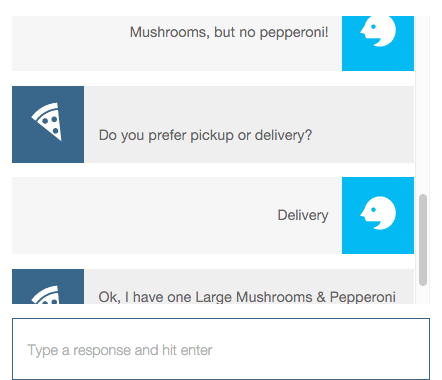 In the second example, the user started out at a much higher level, but the pizza app successfully led them through the necessary questions to get the information. Follow your user’s lead, and be prepared to handle information in a variety of ways. In the VUI world, this means using natural-language processing to extract information about how the user is feeling. It might sound complicated, but you can begin to do basic sentiment analysis in a fairly straightforward manner. First, you need to define your categories. You can begin simply, for example, with positive and negative. By using lists of positive and negative words, you can compare what the user said, and categorize accordingly. There are even free word lists already created and available for your use, such as the MPQA negative and positive lists, available from the University of Pittsburgh. Open source tools such as KNIME can perform post-processing on your recognition results to examine what percent of the time your users are saying negative words versus positive words. Emotion detection is still fairly new. Companies such as Affectiva have already begun using emotion detection techniques that look at a person’s facial features. The company has employed this in market research; for example, while participants watch movie trailers, it tracks their facial features and determines their emotional response to various parts of the trailer. Beyond Verbal detects emotions via a voice stream by analyzing vocal intonations in real time. 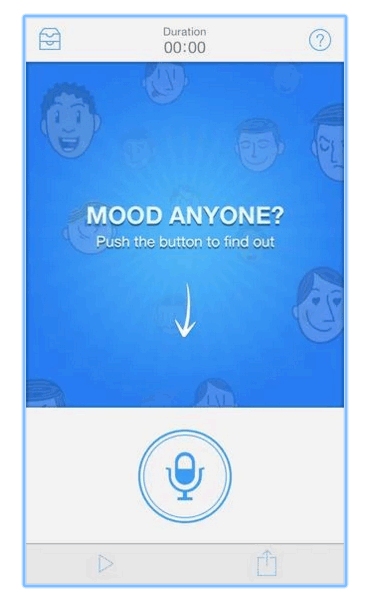 With its Moodies app, users press a button and talk about their thoughts—after 20 seconds, the app displays their primary emotion, as shown in Figure 5-7. One of the key principles to keep in mind when using technologies that deal with a user’s emotion is to always err on the side of caution. Getting the user’s emotional state right is great—getting it wrong can have a very high cost. Never come right out and name the user’s emotion; for example, “You’re feeling sad.” Maybe the user is indeed feeling sad, maybe they aren’t; but they might not want to admit it. We’ve all experienced saying to someone, “I can tell you’re upset,” only to have the person vehemently deny it. Instead, use the sentiment and emotion analysis to steer the conversation. Perhaps someone has expressed negative emotions over multiple days this week when chatting with your VUI; the system could ask more questions, and dig a little deeper into how the person is actually feeling. Context means being aware of what’s going on around the conversation, as well as things that have happened in the past. One reason many virtual assistants—as well as chatbots—currently struggle with conversational UI is because they lack context. Context means being aware of what’s going on around the conversation, as well as things that have happened in the past. Remembering details of the conversation can be quite challenging, but one can still take advantage of basic context to make your VUI seem smarter as well as saving users’ time. For example, you can determine which time zone your user is in and greet them appropriately—“Good morning,” “Good afternoon,” and so on. 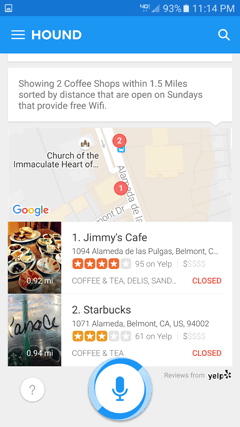 You can use location; knowing that a user is at home and not at the office when they are searching for a restaurant will alter the search results you present. These are jarring reminders to the user that your system is just a dumb computer. Remembering that last week your user got their personal best time when they went for a run is not terribly difficult, computationally speaking. But knowing simple details like that will enable your VUI to engage the user more, to become more trusted, and more personable. Hound has a knack for responding to multiple queries in one. When confronted with a request they cannot answer, many virtual assistants will punt to a regular search command. 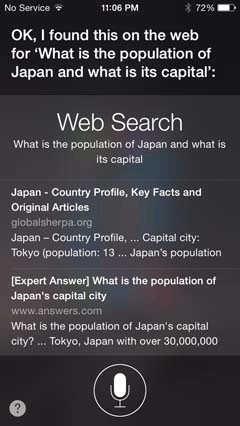 Look at the difference between Siri and Hound when both are asked the question, “What is the population of Japan, and what is its capital?” Siri can’t handle that question, so it backs off to, “OK, I found this on the Web for “What is the population of Japan and what is its capital?” and shows a list of search results (Figure 5-8). 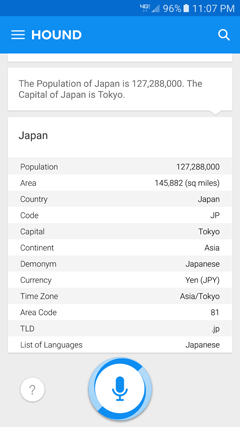 Now, the first search result will actually give you all the information you need, but it does not answer the question directly. In Hound’s case, it says the answer right up front, and then provides additional information (Figure 5-9). Hound has a knack for responding to multiple queries in one. Take a look at this doozy: “Show me coffee shops that have WiFi, are open on Sundays, and are within walking distance of my house.” Hound can actually handle this quite gracefully (see Figure 5-10). This type of query draws a collective gasp when it’s demonstrated before a live audience. It impresses people. But if you break it down, it’s really just a series of simpler commands, concatenated. Let’s try something more complex: from an NLU perspective. 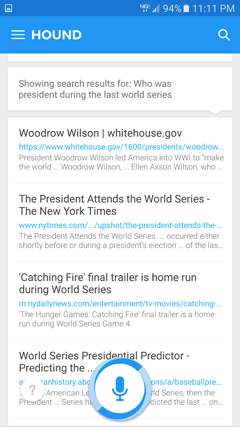 When I ask Hound, “Who was president during the last World Series?” it backs off to search results. The first one? A page on Woodrow Wilson. This query is only asking for one piece of information—but it requires the underlying system to have a much more complex model of the world (Figure 5-11). These examples show that VUI is not a solved problem. In all of these cases, the speech recognition was flawless. It recognized my question exactly. But that’s not enough—in addition, the VUI must understand the subtleties of language. What Hound does is very impressive—but that’s generally not how people talk. If I call up a catalog company to order something, I give the information in chunks. Rather than saying, “I’d like to order a large men’s shirt that is blue and has buttons and is short sleeved and is under $50,” I’m more likely to begin with, “I’d like to order a men’s shirt,” and go from there. Your VUI will be most successful if it can remember what already took place, and keep the system grounded. It might make for a more impressive investor meeting if you can demonstrate rattling off multiple commands at once, but users don’t always mind if a task takes multiple steps. As long as the questions feel relevant, and the user feels like they’re getting somewhere, they’ll put up with a lot. To make your VUI perform above and beyond a basic exchange of information, take advantage of the concepts outlined in this chapter, such as allowing for more complex input by the user by going beyond simple keyword recognition. Think carefully about design choices such as using TTS or a recorded voice. Use natural-sounding concatenation strategies to improve comprehension. Spend time outlining whether your VUI should have a wake word or require push-to-talk. Make your VUI more successful out of the gate by bootstrapping your datasets with information that’s already out there or by doing your own data collection. Using all of these techniques will make your VUI easier to use, more accurate, and more successful. Whitenton, Kathryn. “The Most Important Design Principles of Voice UX.” FastCo.Design, February 16, 2016. Retrieved January 8, 2017. Cohen, M., Giangola, J., and Balogh, J. Voice User Interface Design. Boston, MA: Addison-Wesley, 2004. Pages 6, 8, 75, 218, 247–248, 250–251, 259. Harris, R. Voice Interaction Design: Crafting the New Conversational Speech Systems. San Francisco, CA: Elsevier, 2005. Page 210.